I work with several overhead athletes ranging from swimmers and tennis players to professional baseball pitchers. 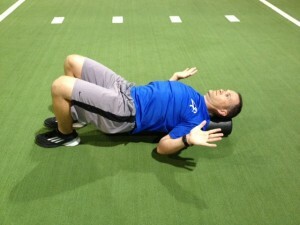 One consistent issue I see is tightness in the anterior chest wall coupled with poor scapular activation and stability. For that reason, I often turn to snow angel exercises. I wanted to share two variations I have written on before. The first version utilizes a foam roller. The movement is performed throughout a full arc of movement upward and downward. This is an excellent exercise that can be integrated as part of a warm-up/movement prep session as well as used in recovery and the cool-down to address soft tissue tightness in the chest, facilitate proper posture and encourage scapular retraction and depression. I often use this exercise in combination with pec minor myofascial release and thoracic spine extension mobilization on the roller. 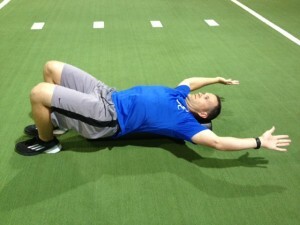 It is a staple in all of my rehab and prehab programs with all of my overhead athletes. The second version involves moving to an upright position and can prove more challenging. The exercise is also designed to promote scapular stability. When done properly, the client will demonstrate proper upward rotation (avoid tipping and winging of the scapula) on the ascent, and then emphasize recruitment of the rhomboids and lower trap to achieve proper downward rotation on the descent. It can be a very fatiguing activity and somewhat frustrating for clients when starting out. Be sure to cue them accordingly, and let them know it may not be easy to keep full contact. It may also be necessary to utilize soft tissue mobilization for the pecs/lats as well as stretching beforehand to promote a more normal movement pattern. In this anti-gravity version fatigue becomes more of an issue, so emphasizing quality movement and using less repetitions may be indicated. Do not push through any painful motion.